Kaitlyn writes… I’ve mentioned in a couple of other posts that I’ve written that my husband, Erik, and I recently did the Whole30 program. We absolutely loved it! One of the rules of Whole30 is that you can’t have any dairy products. I don’t generally eat a lot of dairy so it wasn’t too hard to stay away from it for 30 days. But I did miss having the occasional yogurt parfait! I’ve read about making coconut milk yogurt but just assumed it would be really complicated so I never got around to making it during my Whole 30. Well, this past week I came across a coconut milk yogurt recipe that could not be easier! So I decided to give it a try. Pour the whole can of coconut milk into a mason jar. 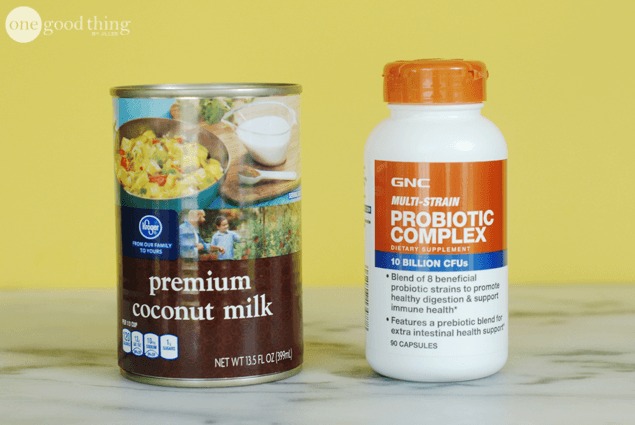 Pull the probiotic capsules apart and empty the powdered contents into the coconut milk. Put a lid on the jar and shake to combine the milk and probiotic. Preheat your oven to 120 degrees, or the lowest temperature it will preheat to. My oven is digital and only goes as low as 170. Turn the oven off. If your oven is similar to mine, prop the door slightly open and let it cool off for a minute. Turn the oven light on and put the jar of yogurt in the oven. Let the yogurt sit in the oven with the door closed for 18-24 hours. When you take it out the next day, put it in the fridge to cool for a couple of hours. Then mix with berries and granola for a refreshing treat! You can make the yogurt with just the coconut cream. Before you open the can of coconut milk, refrigerate it for a couple of hours. When you open the can the cream should be at the top. Scoop that out and save the liquid at the bottom for other recipes. The other option is t0 use unflavored gelatin as a thickener. Click here for directions on using gelatin from Creative Homemaking. Preheat your oven to 120 degrees, or the lowest temperature it will preheat to. Turn the oven off. Prop the door slightly open and let it cool off for a minute. When you take it out the next day, put it in the fridge to cool for a couple of hours. You got it Christine! It’s ready to eat after just an hour or two in the fridge :-) I don’t think the toaster oven would stay hot enough long enough for this to work, and I’m not sure about a dehydrator. Does it stay warm after you turn it off? Give it a try and let us know how it goes :-) As for the shelf life, I’ve had some in the fridge for a week so far and it’s looking great! This is great, I make yogurt for years mixe with a yogurt, can I use it instead of the probiotic capsule and use my yogurt maker. Thanks. What great suggestions, Laura. Thanks so much. I will try the pilot light and choose are suggestions. I eat Chia seeds in yogurt almost every day. It has done wonders for my digestive problems and IBS. Now, to get away from the dairy yogurt. Great stuff here on your site. Clicked on here on FaceBook. So glad you like the blog Maggie! I don’t see why not Judee! I don’t really eat yogurt that much due to lactose intolerance. I was able to download the video of Jillees on the today show. I was at work when it was on. Good job. I don’t eat canned food. Can I make the Yogurt with Coconut milk from the Carton? You definitely can Michelle. However, I’ve never found coconut milk in a carton that doesn’t have lots of additives. I think a healthier choice would be to look for canned coconut milk without any BPA in the cans. Wow, that’s great! Can I do the same with almond milk? I haven’t tried it but I’m assuming you can! It was YOU! I tuned I yo the today show segment just after it started and thought it was you, but wasn’t sure. You did great!